Television has always been the Holy Grail. Since TVs became America’s go-to for nightly entertainment, it’s been the space where ad folks want to play and clients are willing to pay. Countless hours and dollars are poured into making a 30 second clip bound for a brief bit during local news. There the spot competes for America’s shrinking attention span at dinner time, right after that awful ad by the car salesman with the jingle you swear steals more of your soul every time you hear it. Video is still the Holy Grail, and sometimes a well-done TV spot is exactly what you need. But you don’t have to compete with the soul suckers and mom’s spaghetti for your audience’s attention, and you don’t necessarily have to spend big to get the exposure. Like Indiana Jones, you have to choose wisely. 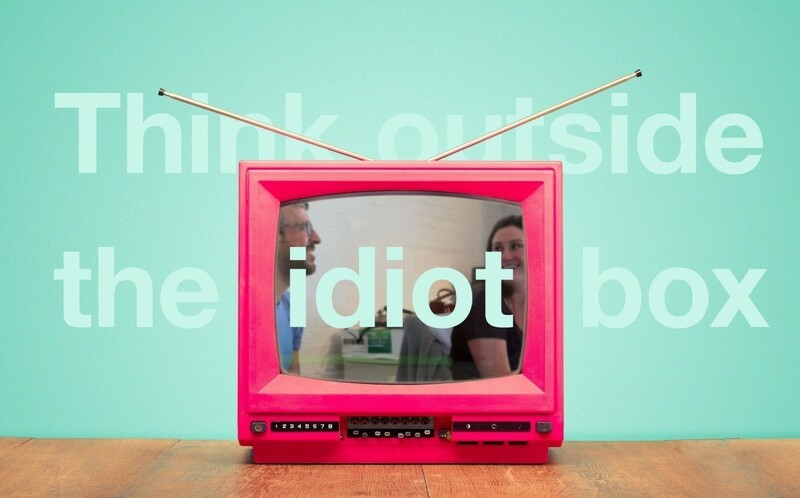 Let’s look at a few ways you can think outside of the idiot box and affordably use video in your marketing efforts. In large campaigns and when the budget is sufficient, there’s value in hitting your audience on multiple media. But one of the lingering hang-ups clients often have with video projects is paying for people to see it – air time ain’t free. Adequate TV buys can cannibalize a clients’ budget, so in order to afford the buy, they skimp on production. This is how the soul-sucking car salesman’s spot came to be. Oh jeez, here it comes again. Hurry, change the channel! We’re working on several video projects, none of which are TV spots. By better utilizing the platforms where the videos will live, we had more room to ensure the product is high quality and has a long shelf life. Two of the video projects I’m working on are for sales teams, while another will live on a dedicated landing page. With this approach, we’re hitting our target audience directly and never competing with Mr. Zero Percent Financing for attention. While video is one of the most important efforts in digital marketing, it doesn’t have to be on a pedestal. Let’s just consider it another arrow in the quiver. A video that lives on a landing page still needs great creative and a thorough marketing plan to garner conversions, and when paired with beautiful web design and development, video can really bring a website together. Video doesn’t have to mean the big time, think of it as a way to bring your story to life. Take OOHology’s Who, What and How pages. We talk a lot about what it means to be an OOHligan, but the sizzle reels in the background really show you. And my favorite part? They’re just the beginning of the content that unfolds on each page. It’s proof that video is a great weapon, but not the only one. Wait, let me make my point before you cry foul. Video is one of the most labor-intensive type of projects I work on. Cataloguing captured footage alone can burn through hundreds of dollars. That’s why you have to treat each piece for what it is. If you are moving forward with a TV spot, then yeah, let’s make it the best ad to ever air next to Mr. We Buy Used Cars For Less. But if you’re just trying to make a video for your social media page, do you really need a five man camera crew? No, I think a GoPro will suffice (and yes, we practice what we preach). I’m not saying to ever put out work you’re not proud of, but I am saying knowing when to go big, and when to go home-movie style can make a big difference when allocating resources. The next time you’re reviewing your marketing strategies, take a look at how you’re using video. High-value and high-production video are more affordable than you think, as long as you’re thinking outside of the idiot box.